Here are her very approachable recipes for 101 everyday staples, organized by supermarket aisle—from crackers to cheese, pesto to sauerkraut, and mayonnaise to toaster pastries. *The Homemade Pantry *is a celebration of food made by hand—warm mozzarella that is stretched, thick lasagna noodles rolled from flour and egg, fresh tomato sauce that bubbles on the stove. Whether you are trying a recipe for butter, potato chips, spice mixes, or ketchup, you will discover the magic and thrill that comes with the homemade pantry. Alana captures the humor and messiness of everyday family life, too. A true friend to the home cook, she shares her “tense moments” to help you get through your own. 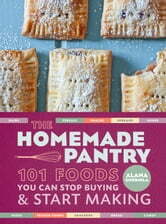 With stories offering patient, humble advice, tips for storing the homemade foods, and rich four-color photography throughout, *The Homemade Pantry *will quickly become the go-to source for how to make delicious staples in your home kitchen.